Vinyasa refers to a series of yoga movements synchronized with the breath. The poses flow with rhythmic variations through each inhalation and exhalation. The breathing style used is called Ujjayi, which is a relaxed diaphragmatic breath with the sound coming from the back of the throat like the sound of the ocean. Vinyasa and Ujjayi together create internal heat, which purifies the body through increased oxygen, circulation and sweat. This breath helps take in fresh oxygen, build energy, and clear toxins from the body. Ujjayi is also said to aide in self – awareness and staying grounded and present during your practice, which is also helpful during meditation. Improved circulation can help ward off illness and aide in recovery of sickness and repair of injury. The circulation in your body is critical to the overall state of health of the body. The exercises performed in Vinyasa yoga are particularly good at improving circulation and increasing energy. Circulation is also improved when the toxins are released during a Vinyasa practice. Lung and heart function are also affected by healthier circulation. It can even lower your cholesterol by lowering stress and in turn eating better. When the nervous system is quieted, the body is much more efficiently digesting and eliminating food and waste products. Bandhas or locks create the spiritual fire dissipating the outward flow of prana back to the center. In the bandhas, the breath is concentrated on a certain part of the body. There are three bandhas: Mula Bandha, Uddiyana Bandha, and Jhalandara Bandha. These locks can be used in the practice to seal off a part of the body to cleanse and tone, and energize the inside of the body. Drishti is a point of focus where the gaze rests during practice to aid concentration. In a yoga pose the drishti can also help keep the body aligned by gazing to the sky or at the floor. The breath, the concentration of the breath and the point of focus all come together in the vinyasa practice. Music and chanting can be part of Vinyasa yoga meant to connect the divine spirit to oneself, or sometimes music to connect yourself deeper to the practice. Chanting usually takes place at the beginning of a class to bring awareness to the sacredness of the practice, a reminder that the practice is not just a physical practice and sometimes at the end of class to seal in the practice and furthermore live it in daily life. Vinyasa yoga can also serve as a strength-training process as it helps to build lean muscle mass and balanced strength throughout the body. The continual flowing movements of Vinyasa stretch and elongate muscles, while the breath allows for fresh oxygen to fuel and loosen muscles making them more flexible, prevent muscles pulls and tears. The fast paced power yoga practice of Vinyasa burns calories resulting in weight loss and maintaining a healthy weight throughout life. As yoga is sometimes referred to as a lifestyle change affecting the whole body mind and spirit promoting overall health of the body and mind, including the practice and healthy eating habits. Regular yoga practice promotes mindful eating habits, and those who eat mindfully are less likely to be obese. 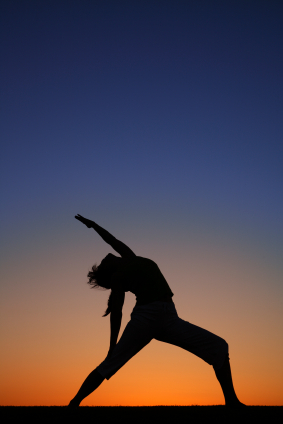 In addition to physical benefits, yoga has many mental and psychological effects. Helping to reduce anxiety and stress, increasing overall health, mood, and concentration during the day. Helping to find inner peace and purpose, learning to be present and self acceptance. Vinyasa yoga usually starts with a fast paced series of poses called Sun Salutations, followed by a flow of standing poses then deeper stretches and backbends; however, there are many variations and flows to choose from. Sun salutation start in Tadasana (Mountain Pose), Uttanasana (forward-bend), Arda Uttanasana (half-lift), lunge, Adho Mukha Svanasana (downward facing dog), plank, Chaturanga Dandasana, Cobra – Bhujangasana or Upward Facing Dog – Urdhva Muhka Svanasana, Adho Mukha Svanasana (downward facing dog, lunge (other side), Tadasana (Mountain Pose). Vinyasa could also be a seated flow including Baddha Konasana, Knee to Ankle Pose, Gomukhasana (Cow-face pose), Janu Sirsasana (Head to knee pose), Upavistha Konasana (Seated wide leg straddle). Or even as simple as a cat-cow flow. Inhaling, spine arched looking up and then exhaling rounding the spine. Vinyasa Krama Yoga is the ancient practice of physical postures in correct order for maximum benefit; it is the sequencing of a personal yoga practice designed with a specific intention for the spirit. The personal sequence can include postures, pranayama, and meditation that help lead to a personal goal. The goal can be for immediate or long- term goals and are applied throughout daily life. ` In Vinyasa krama there are twelve sequenced vinyasas that flow with correct breathing in correct order unrelated to level of practitioner and practiced with sequential linked mantras chanted, heard, or mentally recited while holding ones breath in or out. Other Vinyasa styles include Anusara, Ashtanga, Bikram (Hot Yoga), Jivamukti, Kundalini, and Power yoga. • Anusara, which means flowing with grace, emphasizes heart opening movements and brings focus to alignment of each asana. An intention is learned within each class to facilitate in daily life. • Ashtanga which refers to the eight limbs of yoga (Yoga Sutras of Patanjali) is a series of poses done in the Vinyasa style using ujjayi breathing, mula bandha, uddiyana bandha, and drishti. There are six different Ashtanga series which the student progresses through at his / her own pace. • Power Yoga, like Ashtanga is a vigorous, athletic style of yoga, however, does not follow a set or series of poses. Power yoga can vary from practice to practice and teacher to teacher with the emphasis usually on Vinyasa style flow to increase strength and flexibility and typically minimal chanting and meditation. • Bikram or hot yoga is done in a room heated to 95 – 100 degrees promoting intense sweating and detoxification. • Jivamukti is a physically intense Vinyasa class that incorporates yoga scripture, chanting, mantras, music and meditation. • Kundalini Yoga is one of the more spiritual styles of Vinyasa yoga, but non-the-less can be physically challenging as well. Kundalini yoga helps to release the energy said to be dormant in the body and move it upward through the body by awakening the chakras. Full enlightenment is said to occur when the energy reaches the crown chakra. Vinyasa yoga as mentioned start with Sun Salutation, then usually lead into a flow of standing series, arms balances, deeper forward bends and backbends, twists, hip openers, inversions then Savasana. When performing any posture safety should be a top priority to prevent pain and injuries. Standing postures and backbends require the practitioner to be aware of his/her body and its limitations. Correct alignment in standing poses protects knees, hips, and shoulders. Knowing your restrictions in backbends and not comparing or competing will also prevent injuries. Twisting poses make your back feel good and relaxed, straighten and stretch the spine, improve posture and breathing, improve circulation, aide in digestion and cleanse the internal organs. Twists wring tension in the body helping muscles relax and release fresh blood and nutrients into the body. Yoga inversions are poses where your feet are placed higher than your head. As with all yoga postures, listening to your body is very important. If you experience neck pain during a pose it’s an indication to stop. Inversions circulate the blood in your body taking the blood to the brain. They are said to move impurities out of the lower body and reduce fluid in the ankles and legs. Inversions if done properly and for a sufficient time can be a massage for the internal organs and even keep them in their intended spot inside the body as through the years it is possible for them to become displaced and thus cause ailments of the body. Some people experience neck pain during inversions which is sometimes the result of tension and poor posture. Performing inversions without being thoroughly warmed up could lead to injury. People who have had spine, neck, or shoulder injuries, high blood pressure and/or are pregnant should be most careful when practicing inversion or should avoid these postures. Savasana is done at the end of the Vinyasa yoga practice to seal the practice assimilate what the body just did. Savasana is about letting go completely to relax the mind and body, which is essential for good health. Take time to carefully place yourself in this position called the corpse pose lying on your back with the feet out to each side, arms alongside palm facing up relaxing the whole body including the face and allowing it to be heavy and then resist movement from then until the end of the 5-30 minute pose surrendering to yourself gaining peace and calm. Some of the great yoga masters have said Savasana is the most difficult to master. The goal is to relax every part of the body and just “be”, observe. If the mind gets agitated or distracted, you could use an eye pillow to help relax the mind or just focus your attention again on just relaxing the body. A mantra or image inside the mind can be your focus if the mind repeatedly wanders over time will increase and may one day lead to the final vinyasa of forgetting yourself completely, called Samadhi. The health benefits of Vinyasa yoga far outweigh the risks of the practice. The most simple and most important rule is to listen and respect your body and its limitations. To be content with the present moment from day to day and practice to practice following the principal of non-harming starting with loving and kindness to yourself. Natalie Clee is a certified Yoga teacher. She teaches Yoga classes in the Feasterville, Pennsylvania area. The continual flowing movements of Vinyasa Yoga stretch and elongate muscles, while the breath allows for fresh oxygen to fuel and loosen muscles making them more flexible, prevent muscles pulls and tears. Thanks for posting this informative article.